Horoscopes DCT For March 13! If you look back in time, it is known that ancient people used the sun and the moon positions in the sky and the appearance of certain constellations as a sort of almanac for planting seasons. Nomadic tribes used the constellations of the night skies for navigation, a practice which was later used by many civilizations. Horoscopes and astrology originated with the ancient Greeks, who were sure that a person’s life was pre-determined and predictable by the positioning of certain heavenly bodies (sun and moon) and constellations present at the time of a person’s birth. The practice of reading horoscopes spread throughout the world and through the centuries into the 1600’s, when a man named William Lilly made it more acceptable to churchgoers by calling it “Christian Astrology”. Horoscope history relates to the history of the world. Astrology and its predictions have preceded formal education, books, printing, and other modern methods of communication and learning. Over time, each civilization used these “markers” in the sky as time clocks for planting crops and predicting weather. When star patterns, or constellations, were named the practice of astrology and predictive horoscope readings really began as what we know it to be today. 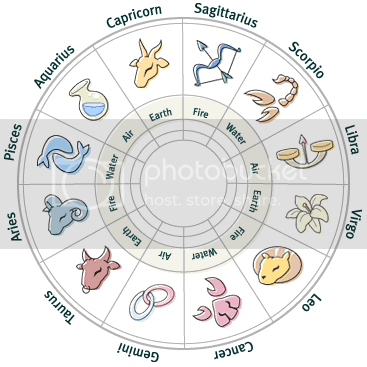 A basic horoscope is related to a person’s birth time, date, and year as well as during which of the twelve Zodiac segments the birth occurs. The year is divided into twelve parts, each named after a different constellation that is prevalent in the sky. Each Zodiac “sign” has both positive and negative characteristics. Horoscopes are customized according to exactly where within the Zodiac segment the birth date and time occur, or what sign you fall under. If the birth date falls near an adjacent sign, the horoscope sign is said to be on the cusp. Horoscope signs (constellation positions) were used in history as a way to foretell the future not only of individuals, but of countries and even the future of the world.In the history of horoscopes, there has developed a link between these astrological attributes and qualities a person may possess. For example, Libra, the “scales” constellation, denotes “balance”. You could probably apply many of the characteristics to multiple signs and have success, but through examination of records and written languages it’s been suggested specific attributes have stabilized for each sign.Most people are familiar with newspaper horoscopes for the day which are based on the sun and become a common part of our culture. The better readings come from a person’s individual birth chart reading, which looks at the birth planet and the interactions or crossing paths of other sky entities and planets acting on that birth planet.The Chinese have also had their own horoscopes but they are different from the better known Greek-based horoscopes. The Chinese horoscope method uses animals as horoscope signs which are the rat, ox, tiger, rabbit, dragon, snake, monkey, boar or pig, horse, sheep, rooster and the dog. The Chinese horoscope has an unclear past as far as when it began, however it has been used for centuries.Over the history of horoscopes wars have been fought and presidents protected (Reagan 1981 - Nancy Reagan made modern history consulting an astrologist following assassination attempt on him). Horoscopes are interesting, fun, and may indeed be very accurate. By tradition, the twelve horoscope signs are: Aries (March 21-April 19), Taurus (April 20-May 20), Gemini (May 21-June 20), Cancer (June 21-July 22), Leo (July 23-August 22), Virgo (August 23-September 22), Libra (September 23-October 22), Scorpio (October 23-November 22), Sagittarius (November 23-December 21), Capricorn (December 22-January 19), Aquarius (January 20-February 19), and Pisces (February 20-March 20). What Horoscope sign are you? Cool DCT, but I don't think Horoscopes are true. Some readings, I think, that do come true, are out of pure chance. Anyway, thank you for putting this together for us! Rep point! I'm a Libra, and this is an interesting DCT. Hi everyone! Interesting DCT, hm.. let me see... I'm a Leo!